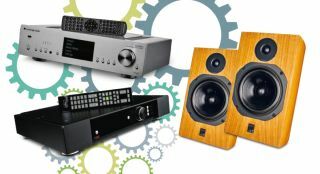 Best music streaming hi-fi system for £3300 | What Hi-Fi? Like the glory of an open fire on a winter’s evening, with the attendant magnificence produced when you throw on another block of wood and a whiff of smoke escapes the mouth of the chimney, there will always be a desire for physical media in the world of hi-fi. Yet, as central heating has in many ways usurped the wood fire, the rising prominence of network streamers is pushing home listening into an ultra-convenient 21st-century domain. When it comes to your streaming-based system, it’s best (though admittedly never easy) if you commit to as healthy budget as possible, rather than skimp on quality just so you can get your kit more quickly. If, that is, sound quality is as much a priority for you as convenience. Once you’ve gathered the requisite funds, the good news is you won’t necessarily have to forego features in order to enjoy good sound quality. The Cambridge doubles up as a pre-amp, meaning you can link straight to a power amplifier, and it's packing two 24-bit Analog Devices DACs working in dual differential mode (meaning lower distortion, more transparency and greater detail). And it boasts two coaxial and optical inputs alongside three USBs and an AES/EBU input, thereby providing no small measure of versatility for partnering kit. In this system, we’re pairing the Cambridge with Rega’s Elex-R amplifier (with built-in phono stage, so you don’t have to bin all your vinyl in favour of streaming modernity), and a pair of ATC SCM11 speakers. In essence, this set-up (each component of which held onto its Award last year), is just great across the board: detailed, dynamic, great with timing and hugely transparent. We’ve long used the Rega/ATC pairing as reference when testing a similarly priced source, and we know that if you take care with the source you place at the start of the chain, this Rega/ATC combination will deliver more faithfully than a Catholic Labrador. So when we play Bon Iver’s 22, A Million, we are entirely unsurprised to hear the Cambridge’s performance in all its glory. That glowing midrange, with its wash of vocal harmonies in ethereal reverb, comes across as gorgeously full-bodied and warm - though without any sacrifice of detail or evenness in the balance. There’s also a widescreen view of the Azur 851’s spacious soundstage and fine focus, with instruments and samples placed naturally among each other, each in their own space but undeniably tethered to one another. That’s a sign of the sense of timing these products share as well – it’s one of the aspects with which streamers can sometimes struggle, but here all three components are easily capable of organising the various off-beat and off-kilter rhythms that make up this sonic collage of an album. As we alluded to, the glory of this Rega and ATC marriage at the end of the chain is such that, if you have the extra budget to invest in Naim’s Award-winning ND5 XS, they are more than capable of showing off the jump in quality of your source. But for the sheer value it represents the Azur 851N, with its full-bodied, rhythmic and spacious sound, easily earns its place here. For insight and transparency, we can’t praise this system enough.